Nearest: Tube Station: King"s Cross Thameslink 88 yards (80 metres), Railway Station: London Kings Cross 0.1 1 miles (0.2 km), DLR Station: Tower Gateway 2.4 miles (3.9 km), Motorway: M1 Junction 1 5.5 miles (8.8 km). There are 3 mainline railway stations within half a mile (0.8 km). The Travelodge Kings Cross London is situated on the edge of central London and at the start of the City of London. Ideal for anyone needing access to the mainline stations at Kings Cross and St Pancras which also means there may be some background noise from these stations. St Pancras is also the London terminus for the channel tunnel train service (Eurostar) which goes rigth through to Paris. Many small shops and bars in the surrounding area while nearest main shopping areas can be found at Camden High Street, Islington High Street and Holborn. Nearest attractions are the British Library and Camden market. Parking is available at a nearby pay car park, a few minutes from the Travelodge. The Travelodge Kings Cross features a Bar Café Unlike most bar cafes the one at this hotel only serves a continental breakfast. The bar is fully licensed and stock with wines, lagers, beers, soft drinks and spirits. Fully non-smoking and has WiFi internet access (for a fee). Travelodge provide standard facilities across their UK chain in order that the customer knows what to expect at each Travelodge. Standard facilities include King-sized bed and duvet (in most Travelodge's), spare pillows in wardrobe, En-suite bathroom with shower, Remote-control colour TV, Tea and coffee-making facilities, Direct dial phone (in most lodges), Internet access and In room films. Onsite standard facilities include a 24 hour reception, breakfast served (charge) and a drink/snack vending machine. Lodges offer express check-in facilities and no need for check-out. Travelodge Kings Cross Royal Scot: is 403 yards (368 metres) away, has a guest satisfaction score of 60% and rates start from about £101. Travelodge Farringdon: is 0.4 miles (0.6 km) from here, earns a customer rating of 80% and base rates begin at about £61. Travelodge Euston: 0.5 miles (0.8 km), rated at 80% and with rates from around £71. Travelodge Covent Garden: 1.0 miles (1.6 km), rated at 80% and with rates from around £70. Compared to other London hotels: This hotel has been rated 70% by past guests. The London average is 80% and the average for 2 star hotels is 68%. Therefore while the hotel is below the overall London average you should note that this hotel is above average for its sector (star rating) . Travelodge Hotels across the chain average 74% so this hotel is slightly below the guest rating for most Travelodge hotels. Milesfaster ranking: 739th from 866 London hotels, 25th of 43 Travelodge Hotels, and 39th of 70 two star rated hotels. If you are looking for something a bit cheaper then take a look at the Travelodge Central Bank. 0.5 miles away (0.8 km), gaining a satisfaction rating of 80% from its past guests with base rates starting at about £49. 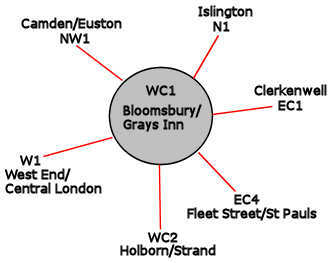 The 50 hotels nearest to this location (Grays Inn Road, WC1 postcode) that we list cover a 0.7 miles (1.2 km) radius. The 50 consist of 3 five star hotels (average rating 89%), 17 four star hotels (average rating 82%), 20 three star hotels (average rating 77%), 8 two star hotels (average rating 71%) and 2 one star hotels (average rating 62%). Top 2 star hotels are Crestfield Hotel and the Generator Hotel (both 77%). Of these hotels the highest rated is Montague On The Gardens Hotel (4 star) at 99%. Base Rates: A look at how hotels compare for starting rates (base rates). These published rates are long term rates so do not take account of special deals and offers. We have calculated the average base rate for all the 50 nearby hotels at £98 per night. The low end of the scale shows rates from £16 at Generator Hotel (2 Star, 77%) to a high of £222 at Renaissance St Pancras (5 Star, 89%). Rate averages for each star rating: Five Star average: £193, Four Star average: £119, Three Star average: £90, Two Star average: £49 and One Star average: £53. We rank hotels based on their guest rating but balanced for their influencing factors and we rank Travelodge Kings Cross 39th (joint) of 50 nearby hotels and 5th (joint) for the 8 two star hotels in the area. Compared to the nearest alternative hotels this hotel is 7th of 50 (4th of 8 two star hotels.) for base rates. Balancing the hotels rates and user rating we rank the hotel 21st of 41 when judging the balance of price point to user rating (Generator Hotel was top). Parking: Not onsite. Nearby pay car park in Judd Street. Note: There are two Hotels with Travelodge Kings Cross in their name.